S100 Total Cycle Cleaner safely cleans your entire motorcycle in minutes! 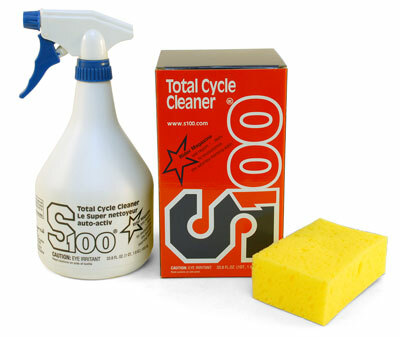 Spray down your motorcycle with S100 Total Cycle Cleaner and let it do the work. Use a soft brush to agitate stubborn spots. Then rinse with a strong stream of water. Towel dry to prevent water spots. This product works well in most cases. ProsEase of use, does good job on most surfaces. ConsMust use extreme caution not to let the product dwell too long, if it happens to dry it is hard to remove spots and streaks.